Vacation days and kids don’t always mix — something that becomes painfully obvious when you’re busy planning the Thanksgiving feast of a lifetime at your home and your bored 5-year-old is climbing the walls and competing with the turkey for your attention. Instead of getting frustrated with our children’s lack of ability to entertain themselves for all of that time (because, let’s be honest, turkeys take forever to cook), there are ways to prevent frustration by actually putting them to work. That’s right: Your kids are better helpers than you probably think. The trick is giving them tasks and responsibilities that challenge them, but are appropriate for their age. Here’s a guide to fun Thanksgiving prep activities and the ages that best suit them. Ages 2 – 5: setting the table — Although children of all ages can set the table and add their own creative spin on decorating place settings, young ones ages 2 to 5 can really benefit from the task as long as you’re willing to provide small steps and guidance as need, Mendez says. Ages 6 – 10: light food prep — Your budding young chef will welcome the opportunity to roll up their sleeves and get to work in the kitchen. Let them handle simple prep tasks and leave more complex ones for older children. “They can be involved in stirring, measuring ingredients, pouring and helping with selection of flavors in the creation of meals,” Mendez says. Ages 11 – 14: serving and cooking — Tweens love to be given responsibilities that make them feel they are valued. The age group can handle choosing plates and bowls in which to serve different dishes and displaying them on the table in an appealing way. When it comes to cooking, parents can trust tweens to take on more complex dishes like homemade cranberry sauce, marshmallow sweet potatoes and desserts. “Children 12 years and older can be involved in cooking a simple dessert, such as making cookies, pie filling, rolling pie crusts and helping with stovetop activities such as stirring and serving,” according to Mendez. All ages: putting kids’ unique talents and skills to good use — No matter what their age, most children love to see their creative contributions valued and appreciated. Encourage them to pursue tasks that make the most of their own talents and skills. “Children may contribute to holiday activities by sharing their talents, such as giving art activities to children with artistic talent, creating a recipe for children with culinary talents and sorting items such as tableware for children with strong organization abilities,” Mendez says. 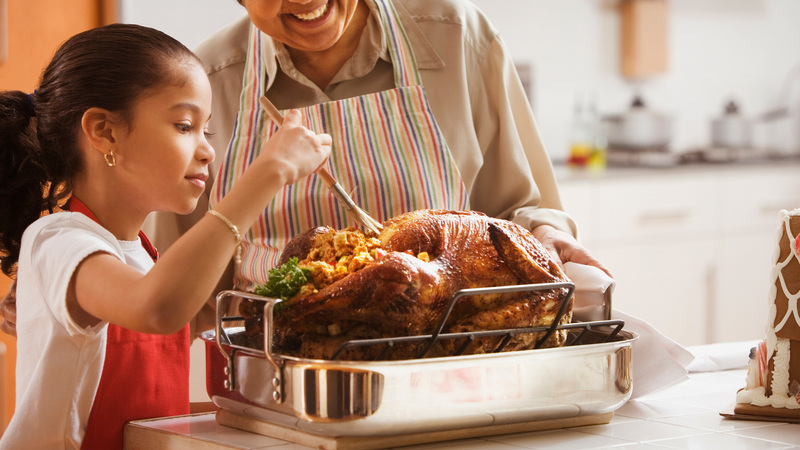 Dedicating a few extra minutes to assigning thoughtful tasks that will keep your kids busy and excited about the holiday will bring you closer together and give you the time and space you need to perfect your Thanksgiving plans.